is quite popular in Japan and there are many shrines in his name. Another reading of the Chinese characters is YAHATA or YAWATA. I lived close to the Tsurugaoka Hachimangu in Kamakura and practised archery (kyudo) in the training hall there for many years. The annual Yabusame horseback riding and shooting was one of the most impressive events I have seen in Japan. 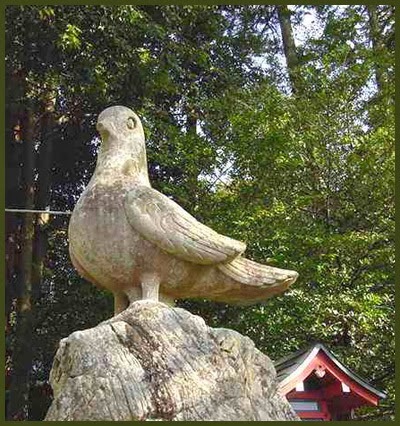 The dove (hato) in the shrine name board as hachi　八 . The dove is the messenger of Emperor Ojin. There are many doves kept in the shrine compound.
. hato 鳩　dove, pidgeon, Taube - in art and amulet . The faith of Hachiman began at Usa Hachimangū and the location of this shrine and five other Hachiman shrines (gosho betsugū) in the Kyūshū area (the five shrines are Chikuzen's Daibu Hachiman, Hizen's Chiriku Hachiman, Higo's Fujisaki Hachiman, Satsuma's Nitta Jinja, and Ōsumi's Shō Hachimangū) show that the faith developed in the Kyushu area in ancient times. When the temple Tōdaiji's Great Buddha was constructed in the Nara period, the "shrine priestess" (negini) of Usa, Ōga no Ason Morime, traveled to the capital and received a "message" (takusen) from Hachiman saying that the kami would assist in the sculpture's construction, thus introducing the cult of Hachiman to the center of Japan. Being located close to the continent, Hachimangū was at the forefront for receiving cultural influences from there and because of this, "kami and Buddha syncretism" (shinbutsu shūgū) developed there quite early. Temples related to Hachiman existed in the Hakuhō Period and these were consolidated into the "shrine temple complex" (jingūji) Miroku Temple, which was established in 725. The journey of Hachiman to the capital and the oracle (takusen) accelerated the tide of shinbutsu shūgō syncretism in the central regions. 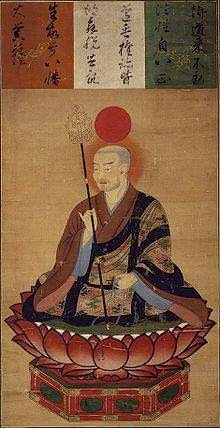 In 781 the imperial court awarded the kami the "kami title" (shingō) "Daibosatsu" (Gokoku reigen iriki jintsū daibosatsu) and images of Hachiman were produced depicting him as a monk. From this, we can see that compared to other shrines, the cult of Hachiman had particularly strong shinbutsu shūgō syncretic qualities. 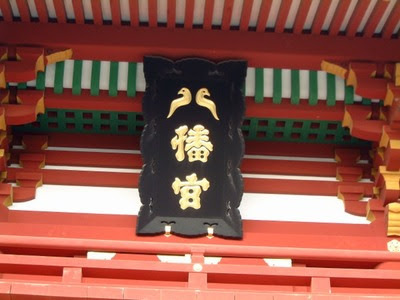 Thus there are many examples of Hachiman shrines "established" (kanjō) as the guardian shrines (chinjusha) of such temples as Daianji, Tōdaiji, Yakushiji, and Tōji. Likewise, the Hōjō-e festival at Hachimangū originates from a Buddhist ritual of releasing living animals that is based on Buddhist prohibitions against killing. In 720 there was an uprising of the Hayato people from the regions of Ōsumi and Hyūga and many Hayato people were killed during its suppression. It is said that Usa-Hachiman was established in order to expiate the sins of killing incurred during this suppression. This story is told at Hachiman shrines in various regions. In the late Nara Period, Wake no Kiyomaro received a takusen from Hachiman which thwarted the monk Dōkyō's scheme to usurp the throne. This incident strengthened Hachiman's character as a guardian kami of the imperial house. In 860 according to the activities of the monk Gyōkyō of Daianji, an emanation of Hachiman was brought from Usa and established (kanjō) as the shrine Iwashimizu Hachimangū. This shrine became the focal point for the cult of Hachiman in the capital. The shrine was called Iwashimizu Hachimangū Gokokuji, and was structured as a "shrine temple system" (miyaderasei) in which "shrine monks" (shasō) such as kengyō or bettō took control of the shrine's management. 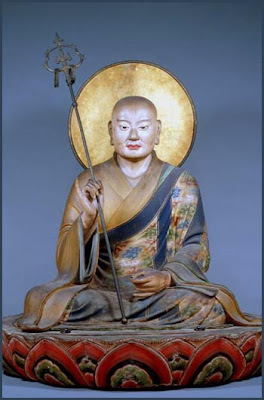 Shinbutsu shūgō developed further at the shrine and the "original Buddha" (honji butsu) assigned to the kami Hachiman was the Buddha Amida (Amitābha). Later Iwashimizu was included in the "twenty-two shrines" (nijūnisha) and was ranked just below Ise Jingū. At the end of the eleventh century Hachiman and Ise were called the "Two Imperial Mausoleums" (nisho sōbyō)and Hachiman attained the status of imperial ancestral kami. Based on this status, Hachiman also came to be regarded as the "clan kami" (ujigami) of the Genji clan. Thus Minamoto no Yoshiie had his coming of age ceremony (genpuku) at Iwashimizu Hachimangū and called himself Hachiman Tarō. Hachiman's character as the ujigami of the Sewa emperor lineage Genji clan come to the forefront and at the end of the Heian Period the shrine Tsurugaoka Hachimangū was "established" (kanjō) in Kamakura. In the medieval period, Hachiman developed from the Genji clan's ujigami into the guardian kami of the warrior class, and many Hachiman shrines were established (kanjō) on estates (shōen) in various regions as the "tutelary guardian of those areas" (chinjugami).
. Yusuhara Hachiman-gū 柞原八幡宮 Yusuhara Hachimangu . is a Shinto shrine dedicated to kami Hachiman. < . Minamoto no Yoshiie Hachimantaro 源八幡太郎義家 . This festival dates back in legend, when emperess Jingu made an offering of a tomo 鞆wrist cover for archery to this shrine. 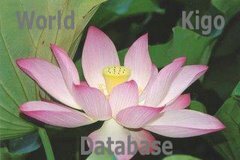 It is now held as a new year ceremony on February 15 to pray for avoidance of evil and a peaceful year. January 1 till 5、the main is on January 3. The official new "seal of the deity" is brought to the stamp office in the shrine compounds. The seal is held to the parts of the believers that hurt and they will be healed from their suffering. A seal from the Bull deity Go-O 牛王宝印 is stamped on paper, put on bamboo skewers and given to the people. This ritual dates back to the Kamakura period, when the samurai prayed for good fortune in the coming year. During the Edo period, Kamakura was famous for the first bonito to be fished at the beaches of the inlay. The very first ones were offered at Hachimangu with prayers for a good fishing season. This was usually done in January or february. In newer years, the first fish of the year landing on the beach of Kamakura was called "ofuri　おふり" and offered to the deities.
. first bonito, hatsu gatsuo, hatsugatsuo 初鰹 (はつがつお) . Basho was well aware of the customs of Edo, where the first Katsuo was an expensive delicacy unknown in his homeland, Iga. The bonito from Kamakura was then carried to Edo as a present to the Shogun. In 1672, prior to taking his formal penname, Basho arrived in Edo and lived near the Nihonbashi Uogashi for a time.
. WKD : Kamakura　鎌倉 a haiku town . yakujin is an evil deity that brings bad luck and diseases. He has to be appeased at the beginning of the year. Yakuyoke 厄除けの神 is a god deity like Hachiman, who prevents bad luck. On January 28 people went to Iwashimizu Hachimangu in Kyoto (see below) to pray for good fortunes in the coming year, at a small shrine in the Otokoyama mountain. There a sacres space was erected between a bamboo fence (himorogi 神籬）), the south side was open. People threw their talismans from the old year in and the whole was later burned. As a "souvenir", people took home a New Year Arrow (hamaya) and a carp or dove made from paper, which they stuck into their hair.
. WKD : Fukagawa Matsuri Festival Haiku .
. Tomioka Hachimangu, Tokyo 富岡八幡宮 . the name "South Festival" contrasts with the annual festival at shrine Kamo Jinja in the north of Kyoto.
. kita no matsuri 北祭（きたのまつり）"festival in the North"
The Iwashimizu Hachiman-gū (石清水八幡宮) is a Shinto shrine in the city of Yawata in Kyoto Prefecture. The shrine's Heian period connections with the Kyoto and the Imperial family date from its founding in 859 (Jōgan 1) when construction on its earliest structures commenced. Shrine tradition explains that Emperor Seiwa ordered the shrine to be built in obeisance to an oracle in which Hachiman expressed the desire to be near to Kyoto to watch over the city and the Imperial House of Japan. This vision was reported by a Buddhist monk, Gyōkyō, who had a second vision which led to selecting the Otokoyama location where the shrine now stands.
. Rikyu Hachimangu Shrine in Oyamazaki-cho . and the Heart Pond　心の池 .
. Hakozaki in Fukuoka 福岡県福岡市東区箱崎 . It is one of the three great festivals in Fukuoka. 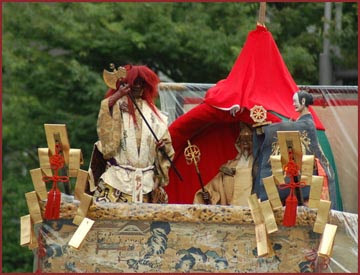 Hojoya Festival (September 12–18) attract many to visit the shrine. at Usa Hachimangu 宇佐八幡宮 in Oita. To appease the souls of warriours, now shells and clams are released into the sea. Because of its mixed religious ancestry, one of the important festivals at the shrine is the hōjō-e (放生会), originally a Buddhist ceremony in which captive birds and fish are released. The ceremony is accompanied by sacred kagura dances meant to commemorate the souls of fish killed by fishermen during the previous year. This syncretic rite fusing Buddhism and Shinto, now performed in many shrines all over the country, took first place here. Emperor Ojin, who was deified as Hachiman-jin (the tutelary god of warriors), is said to be enshrined in all the sites dedicated to him; and the first and earliest of these was at Usa in the early 8th century. The Usa jingū 宇佐神宮 has long been the recipient of Imperial patronage; and its prestige is considered second only to that of Ise. Tsurugaoka Hachiman-gū (鶴岡八幡宮) is the most important Shinto shrine in the city of Kamakura. This shrine, which used to be also a Buddhist temple and far bigger than today, was originally built in 1063 in Zaimokuza where tiny Moto Hachiman now stands, and dedicated to the Emperor Ōjin, (deified with the name Hachiman, the god of war), his mother Empress Jingu and his wife Hime-gami. Minamoto no Yoritomo, the founder of the Kamakura shogunate, moved it to its present location in 1191 and invited Hachiman (from Iwashimizu Hachiman Shrine) to reside in the new location to protect his government. The present location was carefully chosen as the most propitious after consulting a diviner because it had a mountain to the north (the Hokuzan (北山)), a river to the east (the Namerikawa 滑川), a great road to the west (the Kotō Kaidō (古東街道)) and was open to the south (on Sagami Bay). There are a number of sub-shrines on the site, the most important of which are the Junior Shrine (Wakamiya (鶴岡八幡宮若宮（下宮)) at the bottom, and the Senior Shrine (Hongū (本宮)) 61 steps above. The present Senior Shrine building was constructed in 1828 by Tokugawa Ienari, the 11th Tokugawa shogun. Tsurugaoka Hachiman-gū is now just a Shinto shrine but, for the almost 700 years from its foundation until the Shinto and Buddhism Separation Order (神仏判然令) of 1868, its name was Tsurugaoka Hachiman-gū-ji (鶴岡八幡宮寺) and it was also a Buddhist temple, one of the oldest in Kamakura.
. Wakamiya Hachimangu 若宮八幡宮 Shrines list . The Hachiman Digital Handscrolls Project (HDH) is a pilot study to enhance digital presentations of movable image-and-text formats. The innovative open source system HyperImage is the pivotal tool employed to realize the aims of the project. The possible origin of "mikoshi" is said to be found in the Nara Period, when the "kami" of the Hachiman Shrine in Usa was invited on a purple palanquin to Nara for the constructin of the "Daibutsu" Great Statue of Budda. This building was constructed in 1603 and is still used to celebrate the Hachiman Festival on September 15th. If you visit at this time, you may be lucky enough to see the local children's sumo competition. It is the shrine dedicated to Hachiman, here as a protector deity of Yakushiji, founded around 889, with its present structures from 1603.
. . . CLICK here for Photos of Great Bodhisattva Hachiman !
. Fuuji Hachimangu 風治八幡宮 Fuji Hachimangu .
. Isaniwa Jinja 伊佐爾波神社 - Matsuyama .
. Nishino Jinja 西野神社 Shrine in Sapporo .
. Oosaki Hachimangu 大崎八幡宮 Osaki Hachiman Shrine . The Tamukeyama Shrine became the first branch of the Hachiman shrine from Usa. When the legendary Empress Jinguu Koogoo (Jingu Kogo) stayed at the Hot Spring Doogo in Matsuyama on the island of Shikoku on her way to the Korean battlefield, she realized that she was pregnant. To pray for the safe delivery and healthy upbringing of her child, later to become the Emperor Oojin, she had a doll made and offered it to the local Gods. 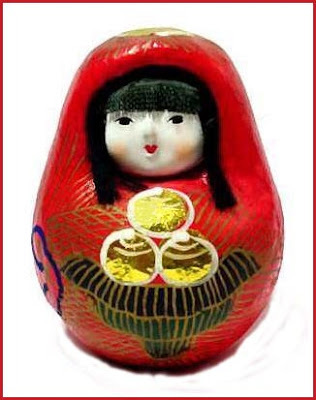 This used to be called the "Roly-poly Doll of Doogo" (Doogo no Okiagari, Dogo no Okiagari). First it was made of wood but later became a papermachee doll. In the last days of February at the Spring Festival of the Matsuyama Shrine and the Iyo Hiko-no-Mikoto Shrine this doll has been sold since more than 200 years ago. It is now a talisman for easy delivery and the healthy upbringing of children and getting well after a disease. In all shrineｓd dedicated to Hachiman the doves (pidgeons) are kept as sacred animals messengers of the deity.
. hatobue 鳩笛 pidgeon whistle, dove flute . The Miyakehachiman Shrine was founded in the reign of Empress Suiko by the envoy to China, Ono no Imoko　小野妹子, who was ill on the trip and got healed by praying to Hachiman. This shrine is also known as 'Mushihachiman'. It is believed that child's bad health is healed.
. koma...　狛　shrine guardian animals . "deity of preventing bad luck"
"deity to bring bad luck"
Temple Toko-Ji 東光寺 in Hyogo, Nishi no miya town. Especially visitied on January 18 and 19 and the Star Festival on Feburary 3, when people in their "unlucky year 厄年" come to pray for protection.
. ujiko 氏子 local worshiper, parishioner . Kyōun-tsukamiya For great luck; the arrow pins down good luck. In this shrine the deity of the sea is venerated in the hope for a good catch, especially katsuo Bonito. Chinjufu shogun (Commander-in-chief of the defense of the North). The first son of Minamoto no Yoriyoshi, he proved himself in battle with the Abe clan in the Zenkunen War (Early Nine Years' War) and the Kiyohara clan in the Gosannen War (Later Three Years' War). Subsequently, he became something of a paragon of samurai skill and bravery. Because as Emperor Ōjin he was an ancestor of the Minamoto clan, Hachiman became the tutelary kami (氏神 ujigami) of the Minamoto samurai clan. Minamoto no Yoshiie, upon coming of age at Iwashimizu Shrine in Kyoto, took the name Hachiman Taro Yoshiie and through his military prowess and virtue as a leader, became regarded and respected as the ideal samurai through the ages. After Minamoto no Yoritomo became shogun and established the Kamakura shogunate, Hachiman's popularity grew and he became by extension the protector of the warrior class the shogun had brought to power. For this reason, the shintai of a Hachiman shrine is usually a stirrup or a bow. This hokku is from an anthology edited by Morita Gemmu, one of Issa's early haikai teachers.The 1788 anthology, Haikai on the Fifty-Three Stations, contains hokku about the fifty-three station towns located on the Tokaido Pacific Coastal Road running between Edo and Kyoto. Issa has twelve hokku in the anthology, and the above hokku is in the "Okabe" section. The reference seems to be to the Aoyama Hachiman Shrine, a Shinto shrine near Okabe that held an annual festival on lunar 8/15, the time of the harvest moon, during which fish and birds were freed from captivity. The festival, called Hojo-e, or Ceremony to Free Living Beings, was originally a Buddhist ceremony to pray for freedom for all captive living beings, but the ceremony came to be held at many Shinto shrines as well. Most of these ceremonies were held in the middle of September, and in Edo at this time of year turtles and birds were commonly sold in the streets to people who then released them in hopes of improving their own karma. In Okabe the ceremony to release birds and fish was accompanied by religious dancing by young girls and by other Shinto rituals. Most trees blossom in spring or early summer, but at the Okabe ceremonies the seasons seem reversed. Many kinds (iro-dori) of autumn birds in cages have been set free, and Issa seems to pun on iro (also 'color') to suggest that the branches of the trees at the shrine look as if they are covered with blossoms that bloom in the colors of the various freed birds that now perch there. Drawing on the extended meaning in Japanese of blossom/flower (hana) as something overflowing with life and vigorous beauty, Issa also seems to imply (with "too" in the second line) that the sacred dances and other ceremonies are turning the people at the festival into human blossoms -- blossoms wearing colorful robes who are spiritually freed for a time by freeing the many blossoming birds. * This is an autumn verse. The online digital edition of Issa's complete hokku correctly has this hokku in its autumn section: 一茶発句全集（１６）－秋の部（３）. However, Issa's Complete Works mistakenly has this hokku in the spring section. The Shrine dates back more than 400 years.